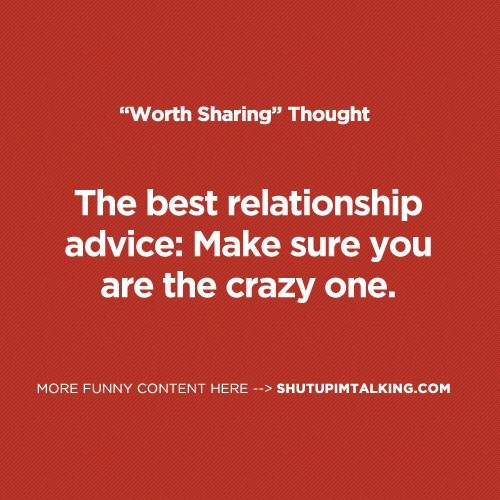 The worst advice to ask for is any advice dealing with a relationship. You can not ask someone to give you advice on something that is so subjective. You’re requesting the person put themselves in your shoes and determine what they would do. That’s damn near impossible. Not only does everyone feel and react differently in relationships but also because decisions are made based upon all of the facts and information. Which is most likely not given because there is way too much to say. It might seem like a simple question when asked but it is a difficult task for the person answering. Truthfully when someone asks for advice they are really doing two possible things. They are either looking for confirmation on their decision or perspective. Or they are just venting some frustration and asking for someone to listen. No matter what there really is no point in asking. The best option is to talk to the other person in the relationship. Open up a healthy dialogue. One that consists of two way communication and active listening.